Technetium is the only element below uranium that does not exist on Earth. It is a synthetic (man-made) element produced in a particle accelerator. For many years, chemists knew that an element with atomic number 43 must exist, based on an empty spot in the periodic table. The periodic table is a chart that shows how chemical elements are related to each other. By 1925, only five empty boxes remained. Five elements were still to be discovered. A number of scientists tried to find those elements. In many cases, the results they announced were wrong. Such was the case with element 43. When the element's "discovery" was announced in 1925, chemists were excited, but no one else was able to repeat the discovery. An error had been made. In fact, it was not until more than ten years later that the element was finally produced. Then, it was created in a particle accelerator and not found on Earth. Today, technetium has very few—but very important—uses. It is used in finding out more about diseases and health problems. It is also used to make steel stronger. In the 1920s, a team of researchers were looking for elements with atomic numbers 43 and 75. This team consisted of German chemists Walter Noddack (1893-1960), Ida Tacke (1896-1979), and Otto Berg. In 1925, the team announced that they had found both elements. They named element 43 masurium, after the region called Masurenland in eastern Germany, and element 75 rhenium, after the Rhineland, in western Germany. Although they were correct about rhenium, they were wrong about masurium. No other chemist was able to reproduce masurium. So, chemists kept looking for element 43. It was finally discovered in the products of a particle accelerator experiment at the University of California at Berkeley. A particle accelerator is sometimes called an atom smasher. It accelerates small particles, such as protons, to very high speeds. The particles then collide with elements such as gold, copper, or tin. When struck by the particles, the targets often form new elements. Element 43 was found by Italian physicist Emilio Segre (1905-89) and his colleague Carlo Perrier. These researchers collected one ten-billionth of a gram of the element and studied some of its properties. They eventually gave the name technetium to the element, from the Greek word technetos, meaning "artificial." Technetium was the first element not found in the earth to be made artificially. It can now be made in much larger quantities, of at least a kilogram (two pounds) at a time. Technetium is a silver-gray metal with a melting point of 2,200°C (4,000°F) and a density of 11.5 grams per cubic centimeter. Technetium is placed between manganese and rhenium on the periodic table. That would lead chemists to believe that its properties are like those of the other two elements. Experiments have shown this to be true. It reacts with some acids, but not others. It also reacts with fluorine gas and with sulfur at high temperatures. Some scientists believe that technetium will be found in very small amounts in the Earth's crust along with other radioactive materials, such as uranium and radium. However, it has never been found on Earth. It has, however, been found in certain types of stars. Its presence can be detected by analyzing the light produced by these stars. All isotopes of technetium are radioactive. The most stable of these isotopes technetium-97, technetium-98, and technetium-99, have half lives of more than a million years. Isotopes are two or more forms of an element. Isotopes differ from each other according to their mass number. The number written to the right of the element's name is the mass number. The mass number represents the number of protons plus neutrons in the nucleus of an atom of the element. 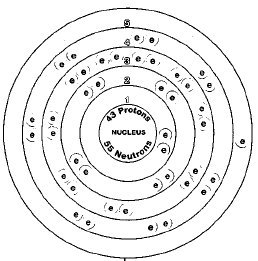 The number of protons determines the element, but the number of neutrons in the atom of any one element can vary. Each variation is an isotope. The half Life of a radioactive element is the time it takes for half of a sample of the element to break down. After about a million years, only 5 grams of a 10-gram sample of technetium-97 would remain. After another million years, only half of that, or 2.5 grams, would be left. Technetium is now produced in nuclear reactors. Neutrons collide with atoms of uranium or plutonium to form new elements. The technetium is then converted to a compound called ammonium pertechnate (NH 4 TcO 4 ). That compound is then treated with hydrogen gas to obtain pure technetium metal. Technetium has never been found on Earth. It has, however, been found in certain types of stars. Technetium is used in steel alloys. An alloy is made by melting and mixing two or more metals. The mixture has properties different from those of the individual metals. Technetium-steel alloys are very resistant to corrosion or reaction with oxygen and other materials. No more than 50 parts per million of technetium to steel produces this property. Technetium-steel has limited uses, however, because technetium is radioactive. People cannot be exposed to technetium-steel directly. There are no commercially important compounds of technetium. T echnetium-99m is an almost ideal diagnostic tool. It has a half life of about six hours. After six hours, only half of it remains as technetium-99m. The rest has broken down into another element. After 24 hours, only one-sixteenth of the original isotope remains. It breaks down and disappears very quickly. When injected into the body, it deposits in certain organs, such as the brain, liver, spleen, and kidney. It also deposits in the bones. Technetium-99m gives off radiation that can be detected very easily. The amount and location of the radiation indicates problems with an organ or bones. Technetium-99m sends out clear, easily observed signals for a short time. Then, it is eliminated from the body. The only problem with technetium-99m is how to get it. If a doctor ordered technetium-99m from a supplier a great distance away, by the time the isotope arrived at the hospital, it would have almost completely broken down! Instead, medical workers use a different isotope, molybdenum-99. When molybdenum-99 breaks down, it forms technetium-99m. But molybdenum-99 has a longer half life, almost three days. When medical workers need technetium-99m, they bring in a container of molybdenum-99. They separate the technetium-99m as it is formed from the molybdenum-99. When molybdenum-99 is used in this way, it is called a "molybdenum cow." Since all forms of technetium are radioactive, the element must be handled with great care. Radiation damages or kills living cells. A significant exposure produces radiation sickness. is it a conductor of heat and electricity? "In 1962 it was reported that traces of technetium could be detected in samples of natural pitchblende from Africa." Never form conclusion when the facts can deny it. I am doing a school project and I need to know what the uses were in the past and what they will be in the future?